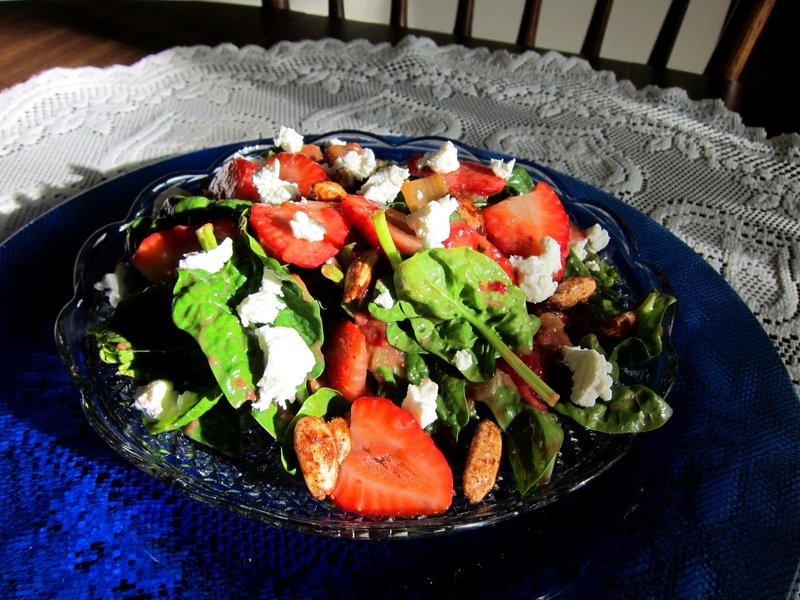 My Mom and I are both fans of strawberries and rhubarb, and since Mother's Day falls in the spring, when they are both plentiful, I thought it might be a good idea to incorporate them in my Mother's Day dinner menu. I was not using strawberries or rhubarb in the dessert course, so I thought they might go well in a salad! So strawberry rhubarb salad it would be! Since rhubarb cannot be eaten raw, I roasted it along with some maple sugar until it was caramelized...to bring out its wonderful flavor. The srawberries I left uncooked, but I decided to puree a few in the dressing along with some balsamic vinegar and olive oil to distribute their flavor throughout the salad. I decided on spinach for my greens, since it looked the most beautiful when I was walking through the produce section at the store, and it pairs well with the berries. Although I could have left the salad as was, simply veggies and fruits, I decided to go ahead and add some spiced almonds and chevre as well to make it more substantial and vary the textures and flavors a bit. The salad ended up being a hit with my Mom who told me that this was one of the best salads I have ever made for her...which says a lot, since I am a salad girl and make them often! It might end up being one of my favorites as well, and I am sure it will need to be made a few more times before the rhubarb is used up! If you are a fan of the strawberry rhubarb combo, you must try it as well! Preheat oven to 375 degrees. Line 2 baking sheets with foil, and spray each with non-stick spray. In a bowl, toss rhubarb with sugar, and spread out on one baking sheet. In another bowl, toss almonds with maple syrup, maple sugar, sea salt, cardamom, nutmeg, cinnamon, and chipotle until well coated. Spread out onto other baking sheet. Roast for about 10 minutes, until rhubarb is carmelized and browning, and nuts are toasted and fragrant. Remove from oven and let cool. In a food processor, combine balsamic, oil, 4 strawberries, and sea salt and freshly ground pepper to taste. Puree until smooth. 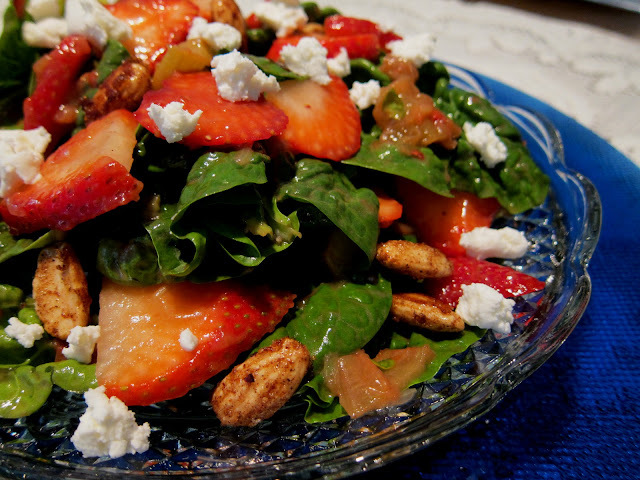 In a large bowl, combine strawberries, spinach, and rhubarb, and toss with the dressing, being sure to coat evenly. Divide the salad between 4 serving plates, and top each with almonds and crumbled chevre. Great photo of a great recipe, thanks!